This decadent S’mores Bread Pudding uses whole grain bread, almond milk, and pure maple syrup for a unique spin on the classic. Studded with chunks of s’mores pieces, this 8-ingredient treat will quickly become a favorite! I made you a bread pudding fit for a queeeeeen!! Or a king. S’mores are one of those special occasion treats, dontcha think? You kind of need warm weather and you kind of need a bonfire, unless you’re ambitious enough to toast the mallows over an open flame in the comfort of your own home. The combination of marshmallows + chocolate + graham crackers is one that most definitely tops my fave treats list. Luckily for you, a bonfire is totally optional for today’s bread pudding recipe. Why no bonfire, you ask? Well HERSHEY’s Kitchens is saving the day with their new HERSHEY’s S’mores Baking Pieces, chock full of milk chocolate chips, graham cookie pieces, and mini marshmallows. It’s like chopping s’mores into a million little pieces. I’ve had a zest for baking ever since I was little. I vividly remember coming home from school to the smell of fresh apple cake, cream cheese cookies, and brownies baking in the oven. I learned recently that my mom actually used to use the recipe on the back of the HERSHEY’S Cocoa for her ultimate brownies (with walnuts of course) and for her hot cocoa! When The Hershey Company reached out about partnering on a couple of blog posts that inspire readers to bake happy, it really all came full circle. It’s so special to me to have the opportunity to bring these warm and fuzzy memories back to life for you all with this S’mores Bread Pudding. Mama approved! Other than tasting like a dream, the other beauteous thing about this S’mores Bread Pudding recipe is that a) it’s insanely easy, b) it has only eight ingredients, and c) it’s totally customizable. Lucky me had half a loaf of whole grain sourdough in the freezer begging with puppy eyes to be made into bread pudding; so I simply thawed it in the microwave and voila. If you’re out and about getting bread for this recipe, I highly recommend getting French, challah, or brioche and letting it get nice and stale so it can soak up all that chocolatey eggy goodness. Save the yummy fresh bread for the dinner table. Be sure to check out the additional baking tips I created for HERSHEY’S Kitchens at the bottom of this post! The HERSHEY’S S’mores Baking Pieces totally make the recipe because…the more s’mores the merrier. Who doesn’t want itty bitty graham cracker squares and baby marshmallows and chocolate drops all studded throughout their bread pudding?! No friend of mine. Upon eating handfuls while I was shooting this recipe, I actually contemplated putting them in a bowl with almond milk and calling it cereal. In my humble opinion, this S’mores Bread Pudding is best served warm with a dollop of vanilla ice cream or whipped cream. It’s a true gift for the taste buds, my loves. 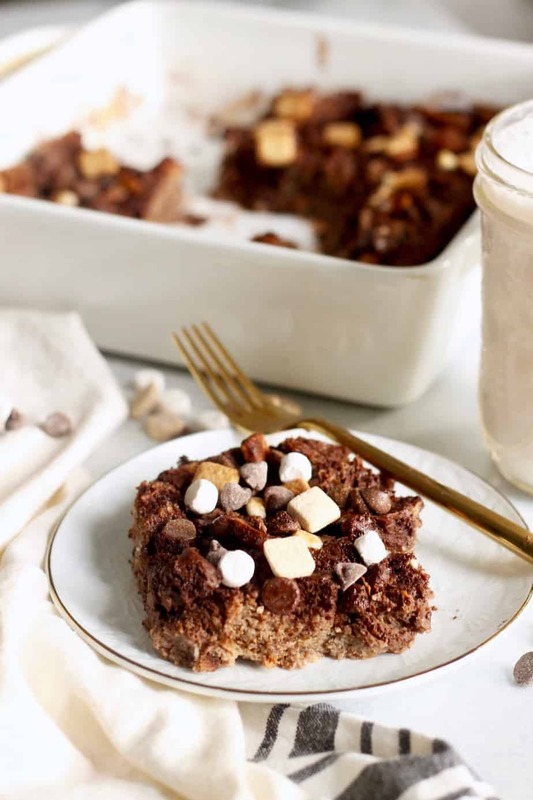 This decadent S’mores Chocolate Bread Pudding uses whole grain bread, almond milk, and pure maple syrup for a unique spin on the classic. Studded with chunks of s’mores pieces, this 8-ingredient treat will quickly become a favorite! Grease an 8x8in baking dish with cooking spray. In a medium mixing bowl or blender, add milk, eggs, maple syrup, cocoa powder, vanilla, and cinnamon. Blend or mix until smooth. Stir in 1/2 cup S’mores Baking Pieces. Pour mixture evenly over bread cubes. Use your fingers to press down any bread cubes sticking out so they absorb mixture. Top with remaining 1/4 cup S’mores Baking Pieces. Let sit for 15 minutes while you preheat oven to 350F. Bake for 45 minutes to an hour (depending on how dry your bread is) or until the top is browned and center is set, but not too jiggly. Let cool in pan on a wire rack. Top with ice cream and serve warm! If the bread isn’t stale, toast it in the oven at 350F for 10-15 minutes. Brioche makes the best bread pudding! Try letting the mixture sit overnight and bake the next day for the most custard-like texture. For a more decadent bread pudding, use whole milk, a blend of milk and cream, or coconut milk for the liquid in place of almond milk. To make this recipe have more of a “custardy” feel, add one to two additional large eggs. For Mint Chocolate Bread Pudding, swap the S’mores Baking Pieces for HERSHEY’S Kitchens Mint Chocolate Chips. I’ve never really liked bread pudding, but I think this combination would actually motivate me to make bread pudding for once. It looks delicious, mm! It’s the perfect recipe when you’re getting tired of cookies and need some dessert variety in your life! Excuse me while I wipe away the drool from my keyboard. This looks so good!! Matt and I finally got molasses (couldn’t find blackstrap, unfortunately), so I’m all set to make your gingerbread this weekend. My twin sister, Kaci is throwing a tacky Christmas sweater party on Sunday, so I’m taking it for us all to enjoy for dessert. I’ll let you know how it turns out! That looks delicious. I love bread pudding and my kids love s’mores, so everybody will enjoy this for sure. I’m going to give it a try and let you know how it went. Yum! I’ve been baking since I was a kid too :) Love this bread pudding recipe!